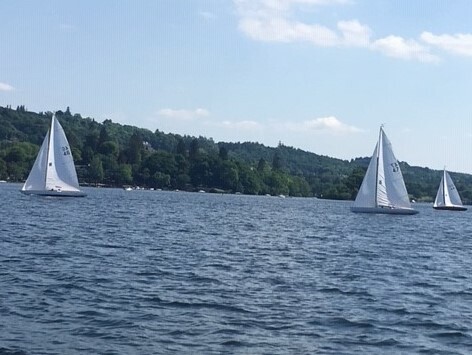 The Royal Windermere Yacht Club’s summer and autumn sailing season has been drawing to a conclusion in the recent wild and windy conditions. Nigel Tullett has crowned a magnificent season by coming out first in both the Windermere 17 Foot Class series in ‘Chameleon’ and the Flying Fifteens series in ‘Niffty’. Windermere 17 Foot Class yachts and Flying Fifteens are vastly different, each requiring particular techniques and strategies to win races. This makes Nigel’s double win remarkable. Windermere 17 Foot Class yachts are often described as ‘sleek and beautiful’, with examples of both modern and classic ‘Seventeen Footers’ in the club’s weekly races. Flying Fifteens, as their name suggests, can ‘fly’ through the water. Designed in the 1950s, modern rig and sail configuration means that they continue to be popular with experienced racing sailors. They are one of the few types of keelboat which is capable of planing downwind, rising up and skimming over the top of the waves. Not to be outdone in the season’s results, Robert Richardson has dominated competitions in the handicap dinghy fleet with his RS100. Competing in 28 races, Robert achieved 23 first places and 3 second places to win comfortably as well as taking the Monday night Denis Hope Handicap series. Coming in second overall place, also in his RS100, was Robert’s father John with 7 firsts during the season, 17 seconds and 4 thirds. Within the dinghy category are the much-loved GP14s which have been a feature of the club for many years. This type of dinghy is ideal for all levels of sailing and racing, is a relatively stable boat and easily recognisable by the distinctive bell on the mainsail. In the all-GP14 series of races, first place goes to John Pawson in ‘Boo’, shortly followed by John and Claire Maclaine. John Pawson also claimed fourth place in the combined dinghies’ series, with John and Claire Maclaine hot on his heels. Throughout the sailing season, the club has held races on Monday and Thursday evenings and every Saturday and Sunday. Only a handful of races have been cancelled – remarkably through ‘lack of wind’ not too much wind! The first half of the season was dominated by the remarkably good summer weather, with the second half of the season bringing stronger, often robust conditions. The club welcomes and encourages a wide diversity of boats, ranging from the iconic Windermere 17 Foot Class yachts to the hectic, light weight, very fast single-handed RS100 and Devoti D dinghies. The ever-popular GP 14s provide a more stable yet still exhilarating dinghy for crews of two people, while Solo dinghies offer a single-handed experience at a slightly less frenetic pace. The cruiser fleet offers yet another option, providing competitive racing in a dual purpose yacht. With winter approaching, some members lay up their boats while others continue to participate in various competitions.